Upgrade your gaming battlestation with these svelte products. The right tools can improve your productivity and comfort tenfold when it comes to working from home. I'm here to tell you that, when the chair you've had for years breaks and you're too lazy to buy another one, you should go ahead and get another chair. Sitting in the floor or on the couch for hours while you work from a MacBook is the quickest ticket to back problems, which I can tell you firsthand. So when I was offered the chance to try out OPSEAT's Grandmaster Gaming Chair and the OPEDGE Gaming Desk, I was elated. I could finally join the ranks of all the Important Pro Gamers with their Branded Gaming Chairs. Mostly, it was time to get my work station in order, which I did with gusto. These pricey accessories don't seem like much at a glance, but I'm pleased to report they worked swimmingly for me and would indeed make a fantastic addition to any gamer's setup. Here's how they've been treating me since I welcomed these bad boys into my home. 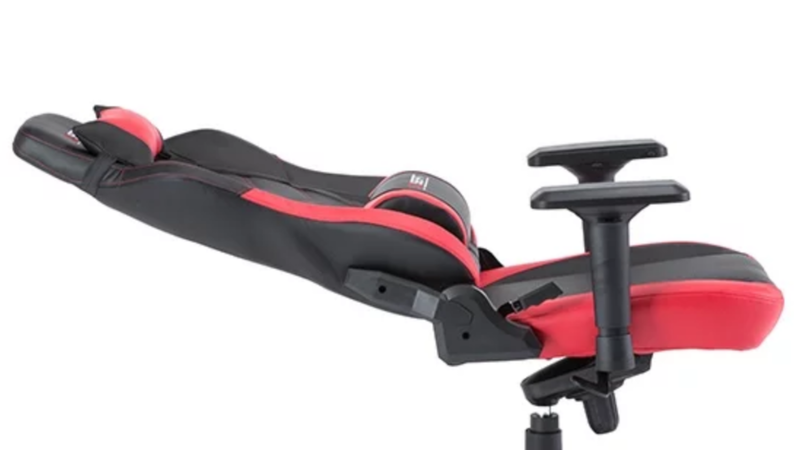 The Grandmaster Series 2018 from OPSEAT is the most luxurious option the brand has to offer, color matched to the desk I was sent as well, a vivid mix of red and black with interchangeable color tips for the chair's base, ergonomic head rest and lumbar pillows, and a seat back that can recline all the way back, just in case you need to nap between all the Extreme Gaming you'll be doing, or need to kick back for some reason. Out of the box and fully assembled, you can tell this thing is doing its best to earn its admittedly pricey $299 MSRP. It's sturdy, attractive, and clearly comprised of quality materials, down to the leather and molded foam. Now, I'm not used to sitting in chairs like these, and I'm typically not a fan of "gaming chairs." I go for comfort over style, and to be perfectly honest, the higher-end office chair I had before it broke and I had opted for sitting on the couch with my computer in my lap for 12 hours straight was one of the more comfortable chairs I've owned in my life. It felt like sitting on air, but it was also double the price. I can't say that the Grandmaster matches that chair when it comes to comfort, mostly because it let me slouch in my seat, which I shouldn't be doing, but this gaming chair is now one of the most comfortable chairs I've ever owned, second only to my slouchy favorite. It's certainly changed the game when it comes to back pain for me, since sitting in an actual chair is probably way better for me than sitting against the couch arm with a dog sitting as close to me as possible. In terms of assembly, I had a family member around to assist with mine for both the chair and the desk, but the instructions, while included in the box, can be a bit unclear. It's a relatively short process otherwise, especially if you're an experienced builder. The packaging was svelte and organized, however, with no missing pieces and a pretty quick build time. If you're not good with assembling products like this, you might want to enlist someone to help out, too. The weight limit for the chair is 300 pounds, which is important to note if you're looking to purchase a chair and happen to be on the big and/or tall side. While the chair itself weighs 51 lbs and rocks a metal frame with synthetic leather, that's the weight that it's rated for. If you're over this limit, you may consider opting for a big and tall office chair so you don't have any unexpected accidents, as this chair may not support you over that weight limit. I received the 4 foot option of the OPEDGE Red Gaming Desk, which is even more expensive than the chair, at a whopping $499 MSRP. It's certainly solid, and is as "ultra durable" as the official product listing suggests. The Formica surface is smooth, easy to clean, and attractive with the pops of color along the front edge. Everything else is black, so as not to clash with your decor. I appreciated that the coloring matched my chair. But then, let's be honest. Literally anything would be a step up from the black plastic TV tray I had been working from while sitting on the couch when my lap got too hot. Joking aside, this is a sturdy and imposing desk that, once you've assembled, won't sway or move when you're in the middle of taking care of important business or just engaging in an all-day gaming marathon. There's a decadent amount of space, and plenty of room to adjust the desk's height, with support up to 250 pounds. The front of the desk is curved as well, which is something I appreciated immensely, especially since desks with straight edges can be frustrating to contend with when you have multiple monitors. After using the desk for around a month with daily use, it's exceeded my expectations, especially how easy it is to clean when I'm averse to dusting often – something I don't even really have to worry about with this particular model. I wasn't sure what to expect going into my time with the OPSEAT desk and chair, but I've been very pleasantly surprised by the craftsmanship, durability, and comfort afforded to me by both the desk and chair. These aren't products I'd typically spend this much cash on, especially since these are particularly pricey, but it's clear you do get what you pay for. I've enjoyed my time with the matching red and black set, and if you're in the market to up your gaming equipment (or mainly for work, like in my case) these are excellent choices to opt for, especially if color and aesthetic are important factors when it comes to kitting out your space. This review is based on products provided by OPSEAT for review. 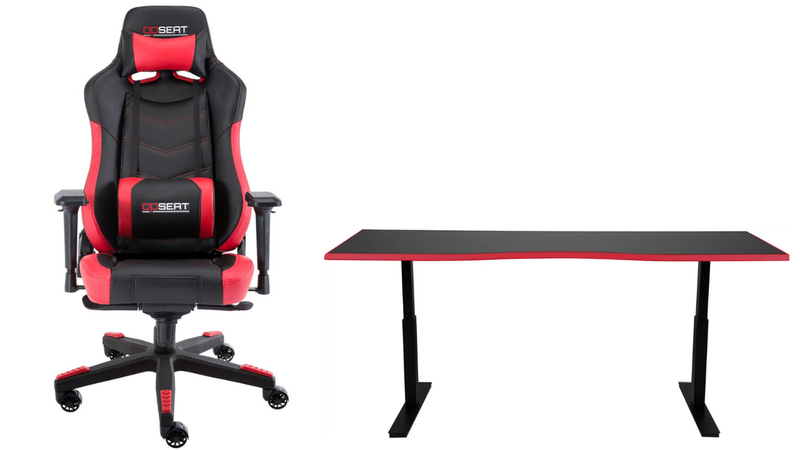 Both the desk and chair are currently available for purchase via OPSEAT for $449 and $289 respectively at the time of this review. Classy exterior in matte finishes. Chair's 300-lb. weight limit should be accommodating to most. Comfortable, breathable leather for chair makes marathon gaming or working a breeze. Expensive, especially when purchased at MSRP.